The amount of data used during Super Bowl 50 at Levi’s Stadium crushes previous records, with more than 10 terabytes transferred over the stadium’s Wi-Fi network on game day. Super Bowl 50 set records, as predicted, and not just of the Peyton Manning variety. It was a record-breaking day because 10.1 terabytes of data was transferred over the Wi-Fi network at Levi’s Stadium on game day, according to the NFL. That’s the equivalent of 6,000-plus hours of HD video or almost 1.2 million 2MB images. This was a 63% increase compared to the 6.23 terabytes of data usage at last year’s Super Bowl XLIX in Glendale, Ariz., as previously reported in TechRepublic’s article, Super Bowl 50 to showcase tons of new tech, shatter bandwidth records. By halftime, the showdown between the Denver Broncos and the Carolina Panthers at Levi’s Stadium in Santa Clara, Calif. had already surpassed the previous record for data transferred at any sporting event. 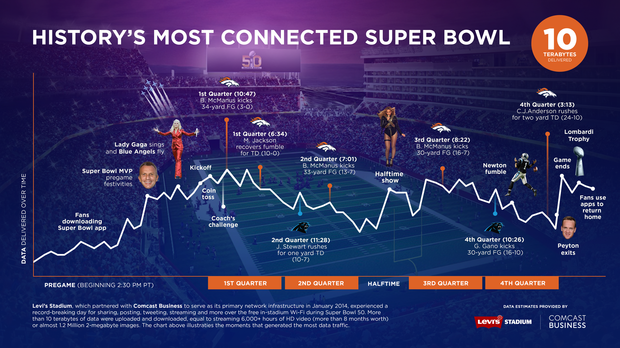 As a result, this means that Super Bowl 50 achieved levels of network performance and data usage never seen before at a single sports and entertainment event, according to the NFL. The data figures were compiled from 6 a.m. to 11 p.m. Pacific Time on February 7. The high tech stadium opened in July 2014 and features 400 miles of data cable, more than 12,000 physical network ports, more than 1,200 Wi-Fi access points, approximately 1,200 Bluetooth beacons, and a backbone of 40 Gbps of available internet bandwidth. Fans used a tremendous amount of the total data, with 9.3TB used from the Wi-Fi network, while media covering the game used 453GB on their dedicated network. Another record was set with the data compiled from all cellular carriers that utilize the stadium’s Distributed Antenna System (DAS) showing that 15.9TB of data was transferred via DAS during the Super Bowl, which is 2.5 times the amount at last year’s Super Bowl in Arizona. Verizon led with 7TB transferred over its network, according to the NFL. Meanwhile, AT&T reported that it had 5.2TB transferred over its network. The number of fans who logged onto Wi-Fi was a record at 27,316 unique users, and a peak of 20,300 concurrent users, at 5:55 p.m. Pacific Time. This topped last year’s Super Bowl record of 25,936 unique users and 17,322 concurrent users. The peak Wi-Fi bandwidth was 3.67 Gbps, set at 3:25 p.m. Pacific Time. This passed the previous venue record of 3.55 Gbps for the NHL Stadium series between San Jose and Los Angeles on February 21, 2015. Levis Stadium also posted a new NFL record with continuous Wi-Fi bandwidth above 3 Gbps for more than four hours. Extreme Networks, the official Wi-Fi analytics provider of the Super Bowl, said that the top app category was social media, and the most accessed was Facebook, followed by Snapchat, Twitter, Instagram and Periscope. The record use of data shows the growing importance of Wi-Fi connectivity in stadiums, as sharing the experience on social networks, using stadium apps, and streaming video has quickly become an essential part of the fan experience.